Resting under the shade of a tea bush one afternoon in 2737 BCE, Emperor Shennong, of China, instructed his servants to prepare his drinking water. Shennong, ahead of his time, liked his water boiled before he consumed it, so it was cleaner and safer to drink. As the servants began to boil the water, however, the hand of fate stepped in and a few tea leaves from the neighbouring bush fell gently into the bubbling water. Just like that – the elixir of life, tea (or ‘cha’ in Chinese) was created and we humans have been hooked ever since. 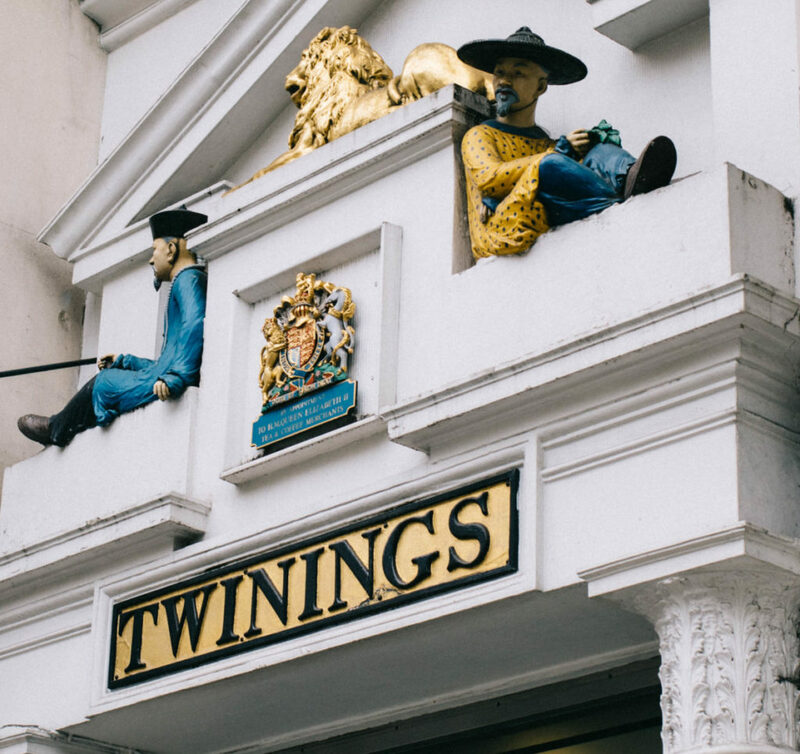 This was the first fascinating story told to us last Friday, as we sat down for a Tea Tasting Masterclass with Twinings at their historic flagship store in London. We were there to celebrate National Tea Day; a day that us Brits take very seriously. Tea has been an integral part of our lives growing up – a drink we consume multiple times a day. It’s a constant companion that has seen us through revision periods; exams; pre-wedding jitters; house moves; and early morning starts at the airport. It’s our comfort blanket and we owe an awful lot to the humble tea leaf. Celebrating it with Twinings, was therefore the least we could do. 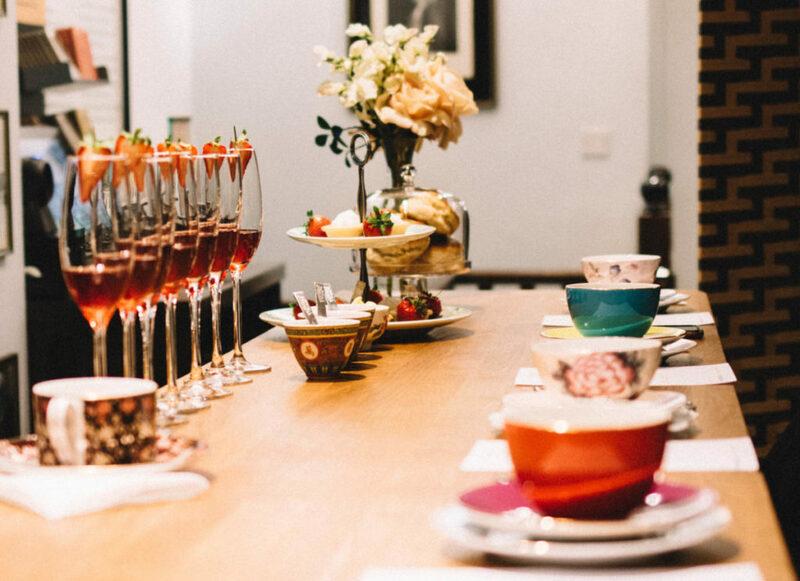 Our Tea Tasting Masterclass consisted of six different teas, each served in delicate, colourful tea cups and accompanied with appropriate sweet treats. 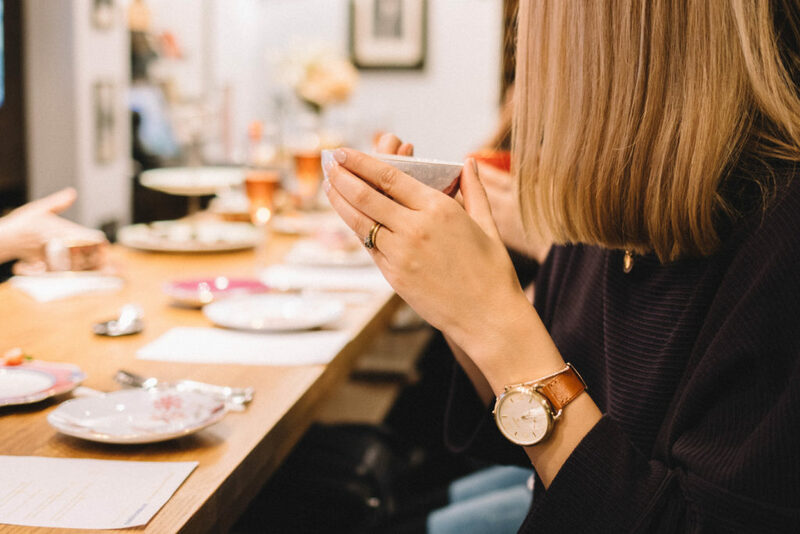 As we sipped and slurped our way through the delicious beverages, our Twinings Tea Ambassador, Julia, took us through the fascinating history of tea; one we found so interesting that we decided we had to share it with you lucky lot! So, grab yourself a tea (no other drinks allowed), sit back and let us take you on the surprising journey of our nation’s most loved drink. 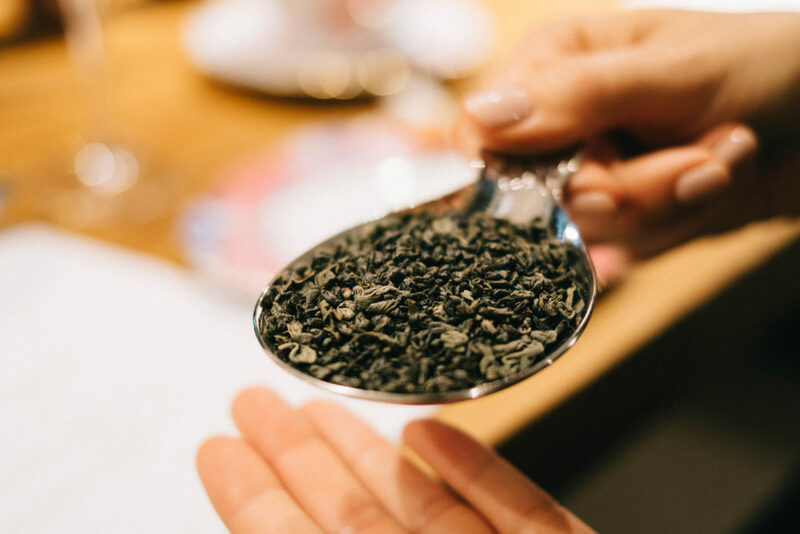 Settling down to sip our first delicious ‘course’ of Prosecco, infused with blackcurrant and lavender tea, our induction to all things tea began with an unexpected revelation. A revelation that almost made me choke on my sparkling drink. For me, tea is synonymous with all things English – it’s our thing. Whilst Italians have coffee, the Portugese have custard tarts and Belgians have beer, the English have tea – an eye-watering 62 billion cups of it are consumed in the UK every year. As it turns out, however, us English weren’t always so enthusiastic about tea and were in fact one of the last nations to start drinking it. The US were even drinking it before us. What?! When tea did arrive in the UK it was originally snubbed by the upper class, who were too busy enjoying coffee in their coffee houses. Furthermore, doctors and the church announced it as dangerous. Yes – tea, dangerous. The hilarity. It was actually thanks to the women of England (as with most things) that tea became popular. Unable to join men in the coffee houses, they took to drinking tea in their own homes. Swiftly moving on from such a crushing revelation, and the Prosecco now drunk (read: gulped down), we were next presented with one of my favourite teas – Gunpowder Green Tea. Except, I’d never tasted it like this before. Soft, silky and light, I silently sipped from my china cup, wondering where I had been going wrong all these years (failing to use filtered water and adding far too much hot water, apparently). Green Tea has been a firm favourite of ours since visiting Japan and witnessing the intricate movements of a traditional tea ceremony, beautifully called the ‘Zen of little things’ (what a perfectly beautiful term). We absolutely loved this ritual and the concept of being mindful and enjoying the simple, slow process of preparing tea. It made us vow to replace our quick dunking of tea bags and splashings of milk with a slower, more careful ritual, using only loose leaf tea. As Julia said, you generally make a cup of tea for the people you love (a few colleagues aside), so why not take more care in the process? Starting to feel the gentle zing of our last two teas entering our system, we giddily moved onto round three of our tea extravaganza. It was here we listened in surprise as we learned of the tea leaf’s journey to the UK and its not so humble beginnings. Indeed, tea hasn’t always been a cheap commodity to be found in most people’s kitchen cupboards. In fact, when it first arrived in the UK, it was so expensive that it was treated like gold; locked away in a tea chest with only one key to access it. The key was kept around the neck of the lady of the house, and only she had access to the chest, or had the authority to make the tea. We had heard of this tradition a few weeks earlier when visiting Jane Austen’s home. It comes as no surprise that it was Jane who was in charge of the tea in her household. So precious was the tea leaf that in today’s society, a casket of tea would cost roughly a year’s earning for a civil servant. This fact completely blew our minds. The concept that a drink that we consume 2-3 times a day would have cost us a year’s wage, seems incomprehensible. Tea was so sought after by the upper class – designed as a way to impress guests – that one particular high society lady found herself in £40,000 of debt to her tea traders. That’s quite the addiction. Our third tea was the Darjeeling Castleton Moonlight Oolong Tea from India, accompanied with fresh scones, clotted cream and jam – aka. heaven. The name, we were told, stems from the fact the tea leaves are picked under the light of the moon. How romantic. As we scoffed down our scones, feeling very British, we decided to ask Julia what type of tea the Queen drank. Knowing that Twinings supplied the Royals with their tea, we were curious. A nice Earl Grey perhaps, whilst watching Coronation Street? Or maybe the traditional English Breakfast, whilst in bed with the dogs? Sadly, we’ll never know, as Julia revealed that the Queen’s tea blend is made uniquely for her, with two master blenders making one half each. Even they don’t know what each part is being mixed with. The magic formula is then locked away at Twinings HQ, behind a lock and key. Although we would have loved to have known what blend of tea her Majesty drinks, we quite liked the mystery surrounding her favourite cuppa. For round four, we were served Nuwara Eliya Lovers Leap tea from Sri Lanka. The tea gets its name from the area in which it’s grown – close to a waterfall where it is said that two lovers leapt to their death. We found the stories associated with each tea leaf fascinating and slightly magical. 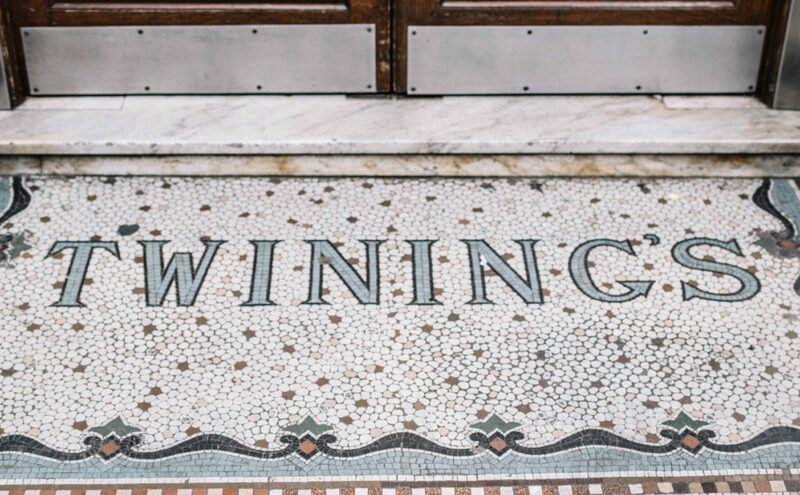 By our fourth cup of tea, conversation began to move to Twinings themselves and their history as tea providers – although they initially started life as coffee producers. We sat enthralled as Julia told us of the Twinings Master Blenders (you have to study for five years to get such a title), who create each tea – sipping and testing hundreds of cups a day. We have, we concluded, missed our calling in life – cursing the fact that a tea master blender wasn’t mentioned by the school’s career advisor. Our penultimate tea was a black Kenyan tea called Kangaita Estate, which had a lovely deep orange glow to it. This, to me, tasted the closest to most traditional ‘English’ teas and one I’ll definitely be adding to my shopping list. Having enjoyed cups of tea on a Kenyan safari many years ago, whilst watching the sun come up over stirring wildlife, it brought back many fond memories. Tea has a way of doing that. Our final tea for the afternoon was the delicious London Strand Earl Grey and a mini lemon meringue pie. Our bellies bursting with tea and puddings, we sat back to enjoy the final moments of National Tea Day at Twinings. With patriotic bunting lining the 300 year old store, and Rule Britannia playing across the room (it really was), it couldn’t have got more British. It may have taken its time to weave its way into British society and (much to my disappointment), other countries may have been enjoying it long before us, but there’s no denying that tea is now a staple of British society. It’s a gentle companion throughout our days, providing a warming hug from the inside out. In short, it’s a little cup of happiness. Tea: we’d be lost without you. I love this post. The stories are fascinating and it sounds like you had the perfect afternoon. I’m just as shocked as you to find that Americans drank Tea before us. If you go out and ask for Tea with milk and sugar here, they bring you Tea, with a glass of milk!!! The audacity!! Hahaha, I’ve experienced that….or weird hot frothy milk on the side! I guess now is not a good time to mention that I don’t drink tea… Although perhaps I’m just not making it in the right way or with the right accompaniments?! It still sounds like a great experience though. There was an amazing tea shop in York that I used to love visiting even though I knew I’d never buy anything from it just because I loved the smells and the huge variety of loose leaf teas in different jars. I really enjoyed this post! I’m curious about the pronunciation of Twinings. I’ve always said it like “whining” but a friend recently said it’s like saying “winning”. How did Julia pronounce it? Love this kind of tea so much.